Why does the Graduate School need private support? The Graduate School is dependent on private donations to raise the level of fellowship support for deserving graduate students. Fewer than half of our graduate students receive any type of financial assistance from the University of Georgia. While our graduate students are among the best and brightest on campus, they are often burdened with low incomes, student loan debt, and ineligibility for programs such as the Hope Scholarship. 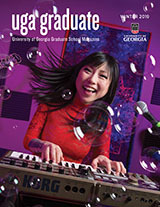 Our vision is that all students who qualify for advanced degree programs at the University of Georgia will be provided that opportunity without financial constraints. The Graduate Education Advancement Fund supports fellowships for deserving graduate students from all schools, colleges, and units throughout the university. All monies designated for this fund benefit graduate fellowships. You can become an active investor in our future by making a commitment to the Graduate Education Advancement Fund. Together, we can elevate the Graduate School to a level of greatness only imagined in the past. How can I support the Graduate School? Feel free to phone Dean Suzanne Barbour or Robin Bingham at (706) 542-6392 to discuss your particular situation and how you can help the Graduate School. Where do you need my support most? The priority for the Graduate School at the University of Georgia is to establish an endowment fund that supports fellowships and helps us attract exceptional graduate students to UGA. As we approach our centennial in 2010, we ask that you consider a gift to the Graduate School. Regardless of the amount, your donation will build a foundation of fellowships throughout the university and help UGA better compete with other universities. The Graduate Education Advancement Fund provides merit-based fellowship support for graduate students from all disciplines. The Graduate School Fund accepts general gifts that benefit the Graduate School, including but not limited to travel, meals, awards, entertainment, equipment, and other expenses as deemed appropriate by the Dean of the School. The Dean’s Award Fund assists graduate students in defraying the cost of doing research for their dissertations or theses and thereby helps them complete their degrees. These funds are not used for travel to professional meetings; they assist students in collecting data or performing some other aspect of their research.